Both mine sleep on the bed with us! We used to have a higher bed so Pippen had stairs to get up (wow, spoiled much?! haha!) but now we have a platform bed so it's easier and they can jump up and down as needed. I think they harass, I mean love my hubby more because he lets them sleep all over him. They like to be up on the pillows or right next to your curled up legs. I agree with you, I love having them on the bed with us! Even if they wake us up! I have three wonderful Scotties and they all sleep with me in a full (double) bed. I wouldn't have it any other way! They are my love bugs and I have trouble sleeping without them. Usually, I sleep on one half of the bed and they on the other, but they are always near me in some way - on the pillow next to mine, spooning if I'm on my side, or laying between my legs. And I love the way they wake me up in the AM by giving me little sighs - and, if that doesn't work, kisses - and, if that doesn't work, "aroos". I'm a single woman and happy to stay that way unless I find a guy that will put up with all the fur kids. Before Danny passed it was the 3 of us in a Queen sized hooman bed. Of course Marlee dictated who slept where. One night, I was in my usual spot crushed next to the wall when Marlee insisted that he get the outside edge! So, he put his Dad in the middle. There we were - me squished up against the wall, Danny pushed up next to me in the middle, and little Scottie Marlee stretched out on the outer 2/3s of the edge of the bed!! hee hee He still sleeps wherever he wishes in the hooman bed, but usually on his Dad's pillow now. 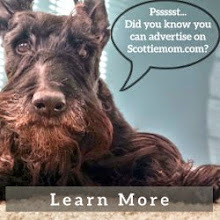 Scottie Mom, I'll probably get kicked out of the Scottie Union, but our objective is to see as much "pretzeling" of the humans as possible. Yes, it is on purpose and we have a competition going-who can make their humans pretzel the most. Welcome to the Scottish games. They do not share. They let you, grudgingly, have a teensy piece of space ... IF you will let them use you as their pillow :-) I'm always amazed at home much space a relatively small terrier can take up if the arrange themselves using geometric triangulation. Gadsby has to jump onto the bed frim the ottoman. He always starts off having to sleep on the outside, perpendicular to me. He stretches out with hia legs behind him. After a few minutes in this position, he pushes through me as I apologize for being in his pathway. There is no around, there is no over, there is only the wet Scotty nose flicking at whatever body part is obstructing his path as he pushes through and then he is in the middle of the bed. Lucy and Haggis have had hooman bed priviledges since day one! I agree that two little bodies can spread themselves thin! But I love to hear the gentle little snores and sighs during the night, Haggis cuddles behind my back and Lucy behind my knees, Scotties rule in our house! Not me, I'm a good bed sharer. I take up a tiny bit at the foot of the bed... Floyd on the other paw... He takes up the WHOLE bed! YES OH YES we have to sleep with The Momma...or the Dadda..or both..At least one of them..we never slept in our beds except for daytime naps...we all need to cuddle with them....Momma usually wakes up with bruises to her rt shoulder from Bonnie kicking her in her sleep like a donkey and Tessie...kicks her..um usually in her ribs...Talloulah is the only one who like to sleep with her head on Mom's feet so when she wakes..she has to hop cause her arthritis in her foot hurts so bad. We need our pawrents..to feel secure..and they need us...RIGHT? We love you guys!!! Big Hugs! 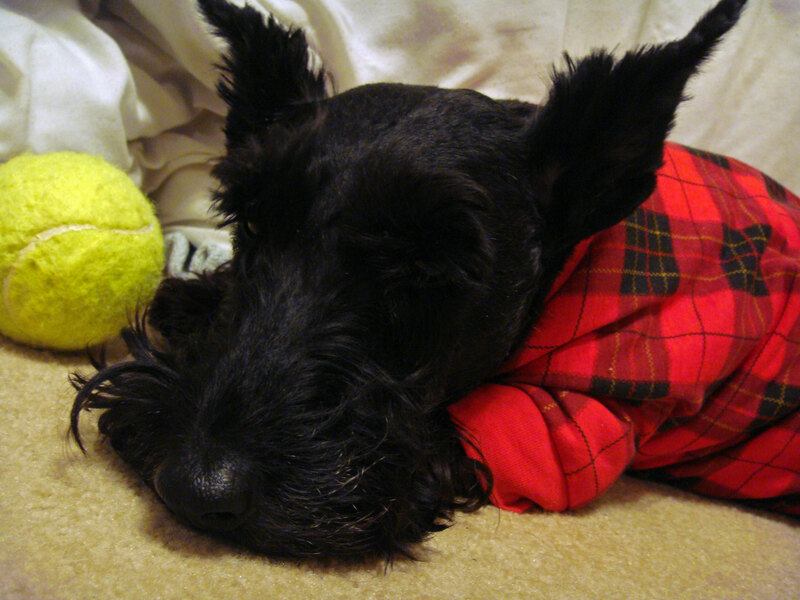 Scotties can sleep WHEREVER they want if you are a true Scottie lover. Winston slept near me on the floor, unless a bad thunderstorm was in the area. Then he was able to 'scruff' the covers into his semblance of comfortable and sleep. Fiona never seemed to mind. Now, my boyfriend says 'no dogs allowed in bedroom at all' and it breaks my heart. So they sleep in their beds right outside the bedroom...except sometimes I 'forget' and leave the door open a crack...hee hee. When I sleep in the other bed, due to heavy snoring or sore backs, Winston sleeps beside me on a rug and Fiona checks up on me...and when the boyfriend travels? All hands in the bedroom to sleep. 1. The Scotties are not allowed in the house. 2. 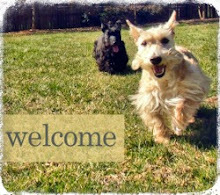 Okay, the Scotties are allowed in the house, but only in certain rooms. 3. The Scotties are allowed in all rooms, but have to stay off the furniture. 4. The Scotties can get on the OLD furniture only. 5. Fine, the Scotties are allowed on all the furniture, but are not allowed to sleep with the humans on the bed. 6. All right, the Scotties are allowed on the bed, but ONLY by invitation. 7. The Scotties can sleep on the bed whenever they want, but NOT under the covers. 8. The Scotties can sleep under the covers by invitation ONLY. 9. The Scotties can sleep under the covers every night. 10. Humans must ask permission to sleep under the covers with the Scotties. I'm not really allowed in the bedroom at all, but I can open doors so I go in and wake them up if I need anything in the night. I like to sleep across the front door, I can keep an eye on everything from there. When I moved into my last house, I also turned a guest room into a room for my dog to sleep. It worked out quite well.